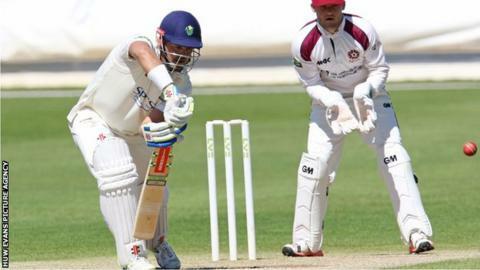 Glamorgan have captain Jacques Rudolph back for their final Championship game against Gloucestershire at Bristol. Rudolph missed the last two matches on paternity leave because of the birth of his first child Noah in South Africa. But Mark Wallace ends his 230-match run of consecutive four-day games - ruled out by a calf injury. "We've mentioned since day one that we want to get into the top four, so we want to go there and get a result," said head coach Toby Radford. "We didn't play well against them [Gloucestershire] at Swansea when they had a slightly weakened side and we were disappointed with that performance, so I think we owe Gloucester a good performance." Glamorgan are currently in fifth place in division two, seven points ahead of the West Country side, who lifted the One-Day Cup this week with victory over Surrey at Lord's. "It's nice to have Jacques back, and there are still lots of points available," said all-rounder Graham Wagg. "We're not far off Northants (one point behind) and we've got to push for a win." Glamorgan could finish anywhere between third and sixth in the nine-team table, an improvement on last season's eighth whatever their final result.